For employers, major sporting events can pose a dilemma: give your workers time to watch the competition and plan for a drop in productivity; or continue with business as usual and risk die-hard fans tuning out. This year's FIFA World Cup in Russia crams 64 games involving 32 countries into just four weeks. During the opening group stages fans can take advantage of as many as three - and on one day four - games a day. If you're in the right timezone, chances are you can catch one or more during normal working hours. 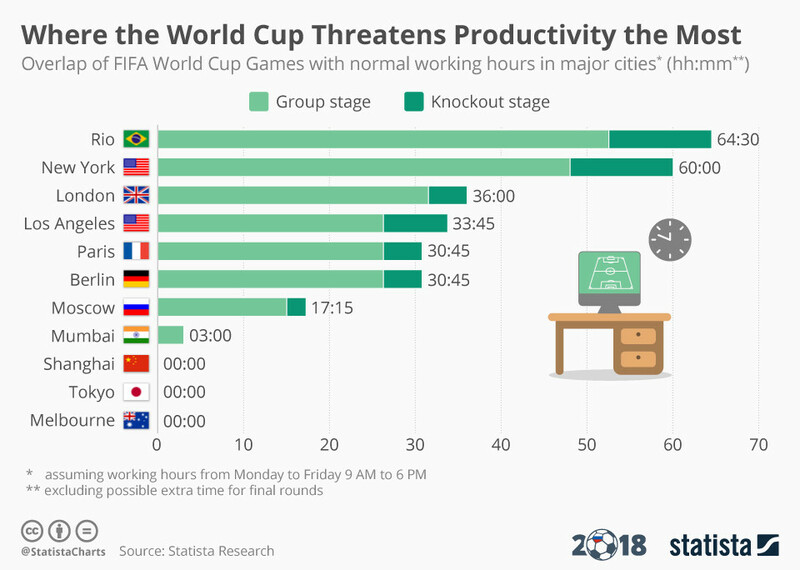 For workers and football fans in Rio and New York the lure of the World Cup may be particularly problematic for bosses: more than 64 hours of the competition overlap with normal working hours in Rio while 60 hours overlap for New Yorkers, according to this graphic from Statista. Though those in NYC won't be watching team USA, who did not qualify for the finals, Brazil are among the favourites to take home the biggest prize in football. In London, Los Angeles, Paris and Berlin, more than 30 hours of the competition fall in office hours. In the UK, the Trades Union Congress (TUC) has recommended flexible working be offered to employees, suggesting time to watch the sporting event can make workers happier and ultimately more productive. "It's important employers do not score an own goal by acting like killjoys," says Frances O'Grady, TUC general secretary.